By Marc Kennedy (Team Canada men’s vice-skip) Most really good Canadian curlers at some point in their career have had the game be pretty cruel to them. They played great; we just didn’t quite have the extra-good today, and that’s the way it goes. 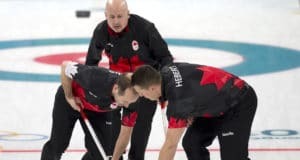 By Kevin Koe (Team Canada men’s skip) We’re headed to the playoffs, and it’s a bit of relief and excitement, all at the same time. By Rachel Homan (Team Canada women’s skip) Obviously, this isn’t where we thought we’d be when we came to Pyeongchang. But I’ll also say I could not be prouder of our team for the way we kept battling here. By Marc Kennedy (Team Canada men’s vice-skip) That was a big hug with Benny at the end of the game today against Japan. By Lisa Weagle (Team Canada women’s lead) Even during our low moments here, we’ve never lost faith in each other. By Joanne Courtney (Team Canada women’s second) We got an amazing phone call last night, and it really got us pumped up. By John Dunn (Team Canada coach) I’ve had the privilege of being at three Winter Olympics, including this one, and it never gets old. By Emma Miskew (Team Canada women’s vice-skip) We were very excited coming off the ice tonight, because we really felt like the team we expected to be at the Winter Olympics. By Scott Pfeifer (Team Canada alternate) After so many years of trying to qualify for the Olympics, it certainly is special to be here today. 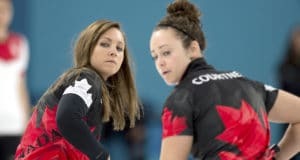 By Ben Hebert (Team Canada lead) We know everybody’s been talking today about Rachel’s team, and we know the first three games haven’t gone the way they hoped. 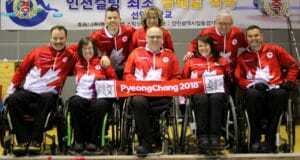 By Adam Kingsbury (Team Canada women’s coach) We all know this is not the start that we expected, but it’s the Olympics — we’ve seen strange things happen in the past. By Brent Laing (Team Canada second) That was the usual grind we always have when we play Thomas and the boys from Norway. In the end, though, Kevin made some great shots down the stretch to get us the win.